From banging through the final leg of Bon Jovi’s “This House Is Not for Sale” Tour to finally getting inducted into the Rock and Roll Hall of Fame with his band in April, it’s been a busy spring for Jon Bon Jovi. So as this Memorial Day unofficially kicks off the summer season, the 56-year-old rocker is, like many of us, ready to wine down. And now he can do that with his own rosé. 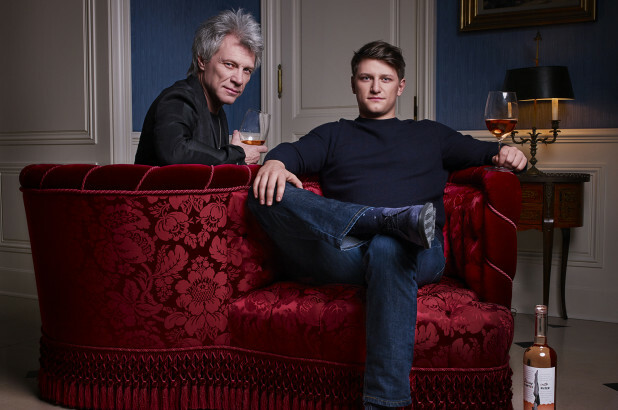 Yes, Bon Jovi is getting in the rosé game: He launched Hampton Water with his 23-year-old son, Jesse Bongiovi, and acclaimed French winemaker Gérard Bertrand, in February. You might not expect the New Jersey rebel who gave us “Wanted Dead or Alive,” to be into creating a delicate, summery sipper, but he says it’s not that big of a leap. The fact that it’s his son he’s working with has been special. “These memories — it’s been amazing,” says Bon Jovi, who joins a list of other musicians — including Sting, Dave Matthews and John Legend — who also make their own wines. But Bongiovi, who, like his father, is based in New York, was the one who came up with the name after spending many summers in East Hampton at the family’s home. From that father-son chat, the idea for the wine was born. Using a blend of grenache, cinsault, syrah and mourvèdre grapes grown in the South of France, the rosé has a light and refreshing taste with a hint of strawberry. Actually, each bottle comes with a strawberry inside at the bottom. Bongiovi — who graduated from Notre Dame, where he majored in political science and played cornerback on the football team — is hoping to bust the stereotype that rosé is a chick drink.